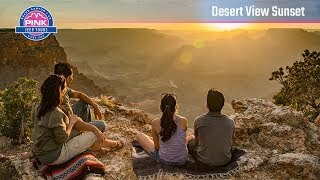 Tour the Grand Canyon at Sunset - Amazing Photo Ops! Take part in a special Grand Canyon sunset tour. Our tour guides will share first-hand knowledge of the unique landscape, and take you to remote viewpoints along the South and East Rims. You’ll ride in a custom-built Pink® Jeep® with no barrier between you and the desert. This is the perfect way to experience The Grand Canyon at sunset. The first stop is at Pipe Creek Vista. Here you’ll stare down a beautifully colored canyon that carves its way into the greater whole of the Grand Canyon. From here, look out to see Vishnu Schist—the oldest rocks at the Grand Canyon. You’ll also see Hance Rapids, some of the most violent whitewater on the Colorado River. Next, continue on your sunset tour to the Desert View Watchtower. Known as one of the best views at the Grand Canyon, it offers a place to sit and view the Canyon and the surrounding 100 miles. Your Grand Canyon sunset tour will finish on the edge of the Canyon, as the sun descends behind the cliffs and the desert begins to glow. Price includes Grand Canyon National Park admission fees and free tickets to the IMAX movie Grand Canyon: The Hidden Secrets.